Ideal for solid wood flooring, plankwood flooring, blockstrip flooring, oriented strand board and cork. 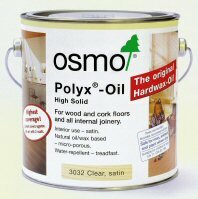 Osmo Polyx Oils are hardwearing and durable. The surface is water-repellent, dirt resistant and resistant to wine, beer, cola, coffee, tea, fruit juices, milk and water. Retains its natural appearance and feel. 1 litre covers approximately 12sq.m with 2 coats. A clear exterior microporous finish. It blocks the greying process by UV factor 12. Water and dirt resistant it also reduces the swelling and shrinking of wood. It will not crack, flake, peel or blister. S&R Opinion: We have tested this product in the harsh Glasgow climate and are very impressed with the results. The timber has not faded or gone grey and the finish is still intact. The end grain has also been protected with the finish that seeped into the wood. All in all, a great product! A exterior microporous finish. It blocks the greying process by UV factor 12. Water and dirt resistant it also reduces the swelling and shrinking of wood. It will not crack, flake, peel or blister. Quick Drying version for professional users, it is possible to apply 2 coats in 1 day. 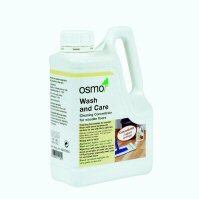 Highly efficient special product to refresh and clean wood surfaces which have been subject to greying. Amazingly it ensures the wood regains its its natural character. 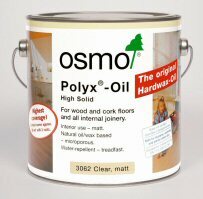 It can then be overcoated with a clear OSMO UV Protection Oil or Butinox 1. 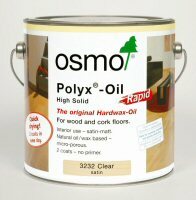 Cleans and regenerates an oiled and waxed timber floor. Water-repellent, and very economical. Cleans and maintains all wooden floors. Ideal for areas of high tarffic requiring regular maintenance. The surface will become resistant against staining and wear marks.